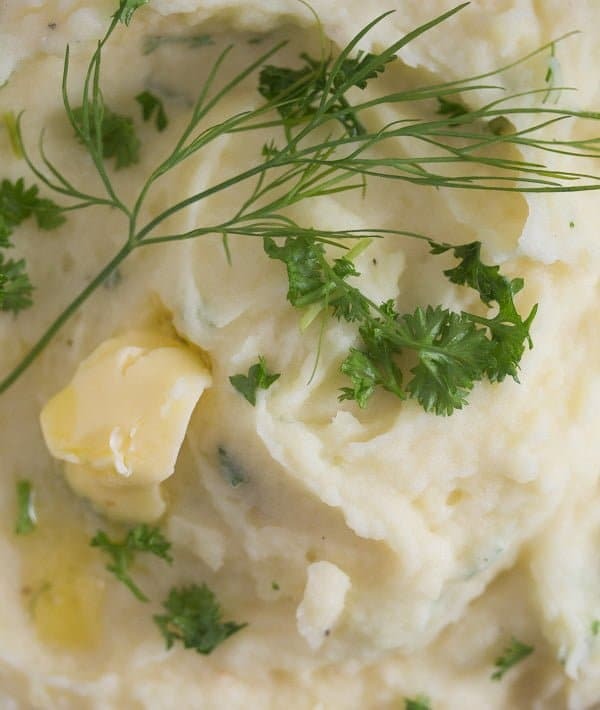 The best garlic mashed potatoes recipe. 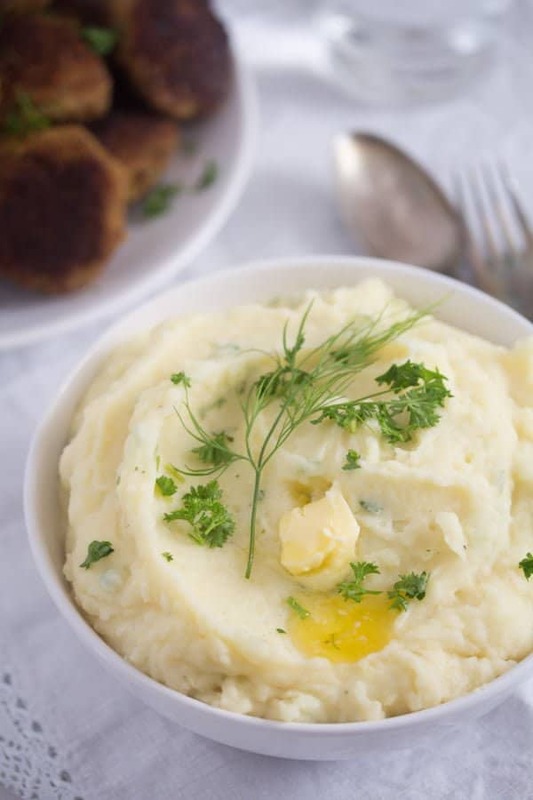 These amazing mashed potatoes are made with roasted garlic and Parmesan. 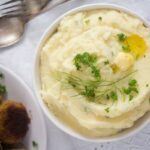 Just in case you are still looking for the perfect potato side dish for Thanksgiving or Christmas, here is a simple recipe for the best garlic Parmesan mashed potatoes ever! Or at least, I have never had any better! I have made these garlic mashed potatoes only about two weeks ago to go with some nice and juicy beef and pork meatballs. Nothing fancy, I thought, just a bit of a twist on the ordinary mashed potatoes. And we were so awed by them, all of us, that I knew it was a recipe I definitely had to post. 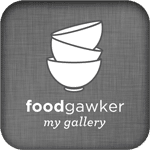 So, I got to making these garlic mashed potatoes again only a few days later (for the pictures and to write down what I actually used for the recipe) and again and again because they are just so damn good! 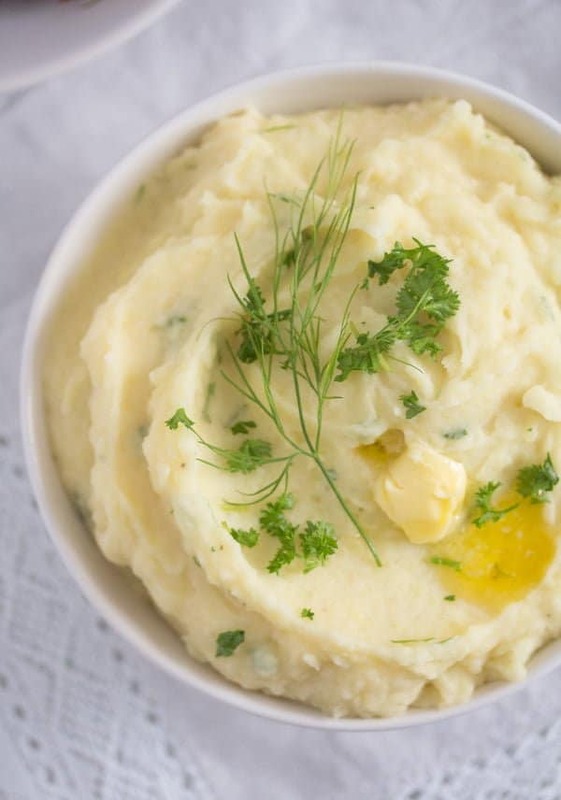 You definitely have to try these mashed potatoes! 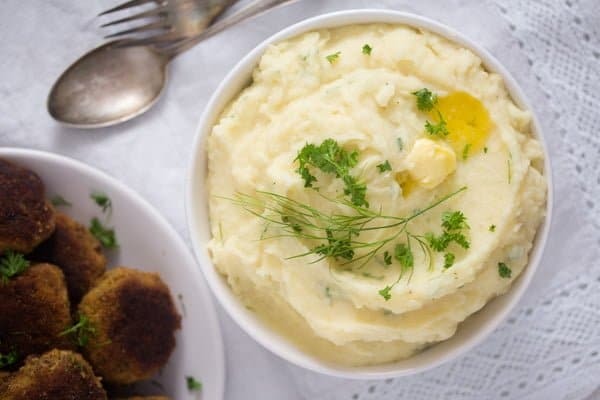 I mean, I love any kind of potato side dish, for instance roasted potatoes or garlic smashed potatoes, even plain boiled potatoes are just wonderful, but these particular garlic Parmesan mashed potatoes are something special, something anyone should try. There are two ways of roasting garlic in the oven. Either you take a whole bulb, cut the upper part away, in a way that will allow you to see the top of the “naked” garlic cloves, wrap the bulb in aluminum foil and bake. I am sure this works very well, but for this potato side dish I have decided to roast the garlic my way, meaning the way I have been doing it for years. I peel all the garlic cloves I need (lots of them), give them to a small oven proof dish, mix them with some olive oil and roast them until they are very soft, so soft that you could actually turn them to a puree just with the help of a fork. When peeling the garlic cloves to make roasted garlic, I leave out the tiniest of the cloves. Every bulb contains some really really small cloves alongside the regular sized one. I leave them out because they will roast much quicker than the other ones and turn too dark by the end of the cooking time. There are other ways of using the roasted garlic cloves, if you wish. I make some kind of crostini for instance, toasting Italian bread slice, smearing them with mashed roasted garlic and serving them with a salad. You could also add the mashed roasted garlic to bread spreads or dips or add some to soups and stews for some extra flavor. So, we have already talked about the garlic, you will need 2 whole garlic bulbs to make these garlic mashed potatoes. 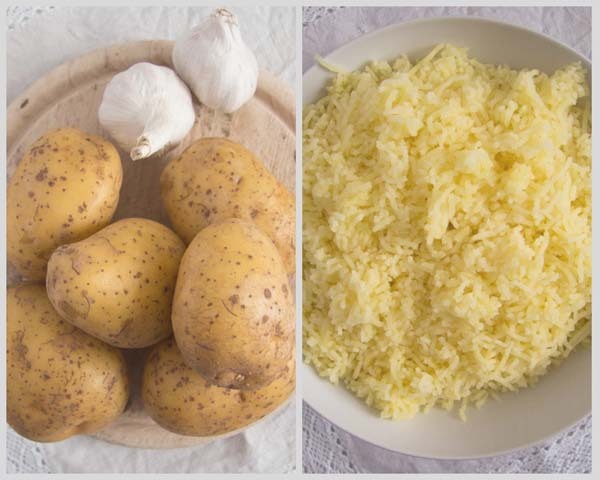 You will also need potatoes, I prefer to use floury potatoes when making mashed potatoes of any sort. However, when I don’t happen to have floury potatoes in the cellar, I do use the regular potatoes, which in Germany are a kind of mixed potatoes called “vorwiegend festkochende Kartoffeln” meaning “predominantly waxy potatoes”. They make very good mashed potatoes as well. And we were talking about the butter and the Parmesan above. Well, the addition of these two ingredients do make the garlic mashed potatoes rich, but I never actually use as much butter as requested in many mashed potato recipes. In this case, I added more than I usually do, but even now we are only talking about 1 ½ to 2 tablespoons butter. You might have noticed when reading cookbooks written by really famous cooks that they always take tons of butter when making mashed potatoes. I have even read recipes using about 200 -250 g/ 7 – 8.8 oz butter for a regular amount of potatoes, something like 1 – 1 ½ kg/ 2.2 – 3.3 lbs. I cannot understand the need, to tell you the truth. I did it once, added almost a whole pack of butter to mashed potatoes (during my younger days) but I didn’t like it that much, at least not enough to justify eating all that fat in just a side dish. I love butter, but so much made the mashed potatoes too soft and fatty, completely overpowering the taste of the potatoes. So, I stick to adding only a small amount of butter to any kind of mashed potatoes I make and if I really want to go overboard I add a tablespoon or two of full-fat cream cheese. Absolutely delicious and if using that you can even leave out the butter completely or add only about 1 teaspoon or so. 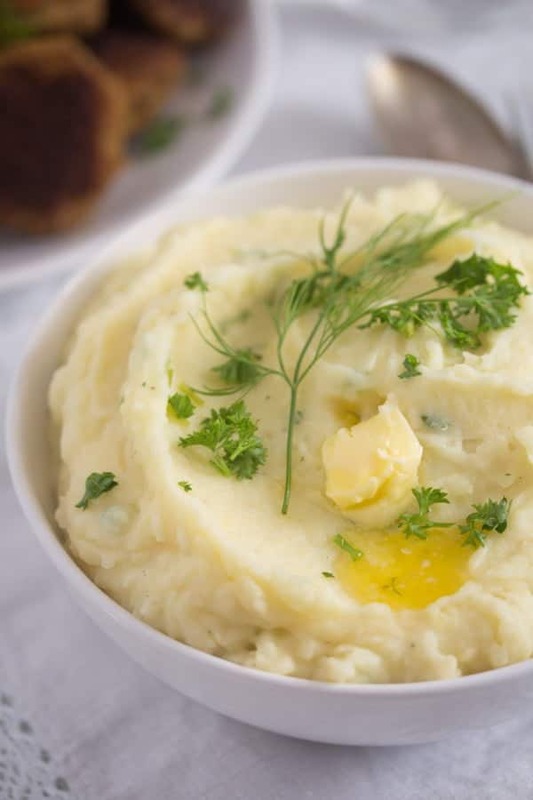 But when making these particular garlic mashed potatoes, stick to the butter, the mashed potatoes are already rather cheesy due to the use of Parmesan. When it comes to the Parmesan, I always recommend using freshly grated Parmesan, there is no comparison between that and the already grated one you can find in the supermarket. 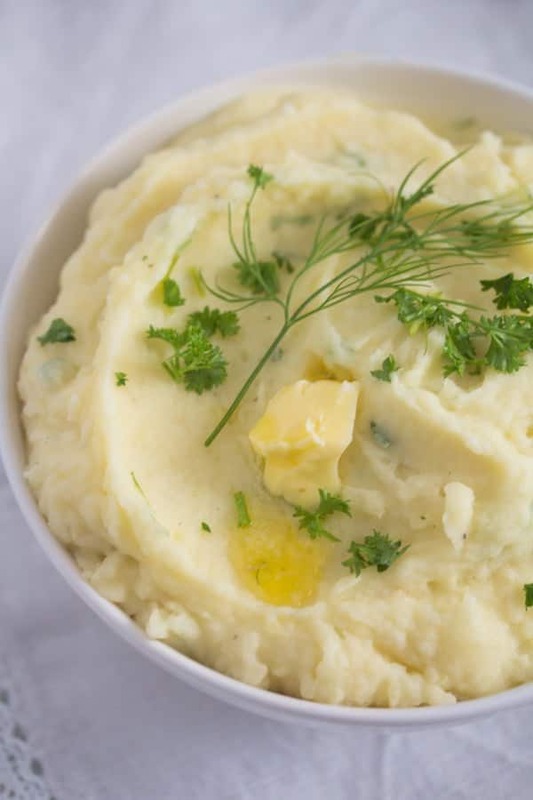 Really, it only takes half a minute or less to grate the amount of Parmesan needed for these garlic mashed potatoes, and that is so worth it when it comes to taste. 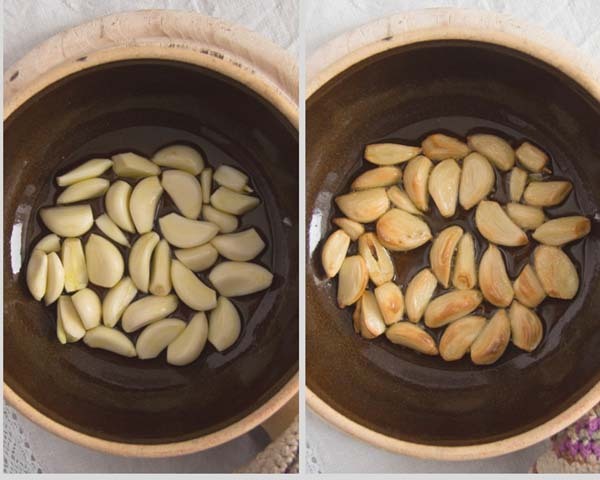 Remove the very small garlic cloves (those that are much smaller compared to the rest of the garlic cloves from the bulbs) and use them for something else. Peel the other garlic cloves and give them to a small oven proof dish. Add the olive oil, rub the cloves with the oil and bake for about 20 minutes, mixing again half time, or until lightly golden and very tender. When ready, puree them in a small food processor or with a hand held blender, together with the olive oil needed for roasting them. In the meantime peel and cube the potatoes. Cook them in salted water for about 15 – 20 minutes or until fork tender. Drain very well. Mash them with the potato ricer or a regular potato masher. Heat the milk in a small pot. Give it to the mashed potatoes together with the pureed roasted garlic and their oil, butter and grated Parmesan. Add salt and freshly ground black pepper to taste. Be generous with the salt but adjust the quantity as required, you will need less salt if using salted butter for the mashed potatoes. Mix well with a wooden spoon. Stir in the chopped parsley and serve immediately (see suggestions above). So creamy, tasty and very comforting!